I was getting ready to go out the other day and I couldn’t decide between business casual or casual casual. I decided to split the difference and wear business casual up top and casual casual below. Smart blouse, awesome jacket, jeans and bright orange Birkenstock Gizeh sandals. 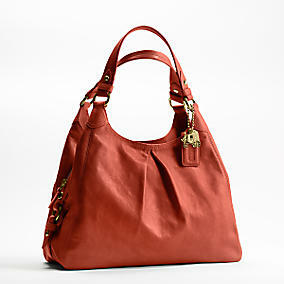 Brown handbag, Cole Haan. As I checked out my look in the mirror, I realized that I was wearing the clothing equivalent of a Mullet AKA business in front, party in the back. This entry was posted on October 21, 2010 at 10:02 AM	and is filed under Handbags, Thought. You can follow any responses to this entry through the RSS 2.0 feed. You can leave a response, or trackback from your own site.